Columbine ‘Crimson star’ (Aquilegia 'Crimson star'): growing, planting, caring. A Columbine with red-and-white flowers. A cultivar growing up to 60 cm , with red and white flowers blooming from May to June. Columbines – Aquilegia — are perennials of the Ranunculaceae family. The flowers, which appear the ends of a bundle of long stems, offer a wide palette of colors including white, light blue, pale yellow, pink, brown, burgundy and blue. If you'd like to carry out a seeding, it's possible to sow in place starting in April, provided the soil temperature is above 12°C. If the climate where you live doesn't let you, just seed under shelter! Just remember that no matter how or when you sow your columbines, you'll still need to wait at least a year before you can enjoy their flowers. To make them come up more quickly, keep your seeds in the bottom of your fridge for at least 15 days before sowing. Columbines will prosper regardless of sun. Normal soil works perfectly, provided that it's light, cool, rich in humus, and not chalky. Plant in autumn or spring, most importantly outside of freezing periods. 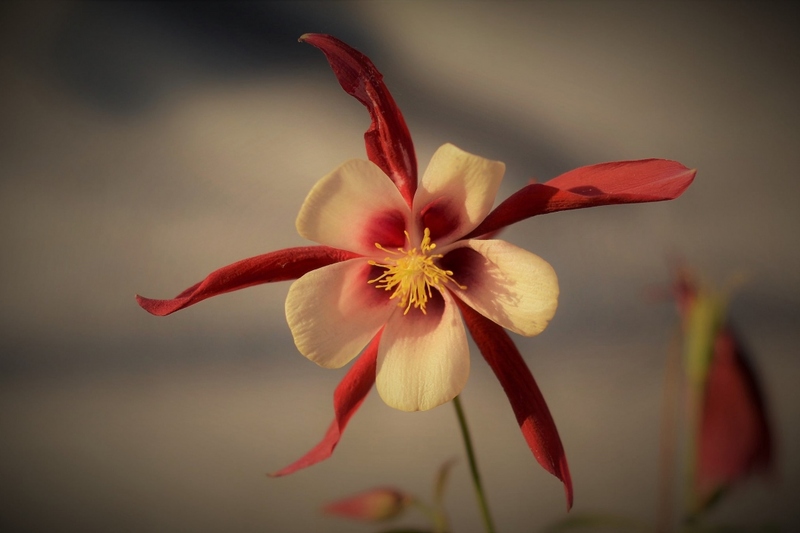 Be careful, columbines have roots that turn — they are very fragile, and it's actually best to transplant the columbine when it is still very young. Prepare the soil with some light digging (to decompact without necessarily turning it over with a pitchfork or broadfork), hoeing, and raking. Plant your columbines while preserving the root ball as much as possible, and leaving a distance between plants equal to 1/3rd the height of the adult plants. Tamp the soil down well so that the roots are not in contact with air, then water generously. Water your columbine copiously in the morning and at night for the first month after planting, then water in regular intervals, especially if dry. Don't get the foliage wet in order to avoid powdery mildew. Columbines don't necessarily fill their soil densely with their roots, so you'll only need to weed them at the base from time to time. Take advantage of the time you take deadheading to look for any signs of powdery mildew! Remove most of the foliage once flowering is finished — you can even do so multiple times a year without risking your plant. Get rid of wilted leaves as needed in order to stimulate new flower growth and to avoid stressing the plant. In this way, you will also regulate spontaneous seeding if you find the plant is becoming to invasive. The easiest way to care for columbines is...to let them take care of themselves! Remember that columbines hybridize very easily — their colors will change from year to year! Mulch around the base of the plant in October and June to limit evaporation in summer and to fertilize and protect the soil during winter. Choose a wood chip mulch in October and a leaf or compost mulch in June. Columbines are highly sensitive to powdery mildew, which is often difficult to get rid of. Therefore, avoid watering the foliage, especially in the summer. Remove infected foliage bit by bit. Columbines are highly prized by slugs, particularly at the start of growth when the leaves are soft and yellow.